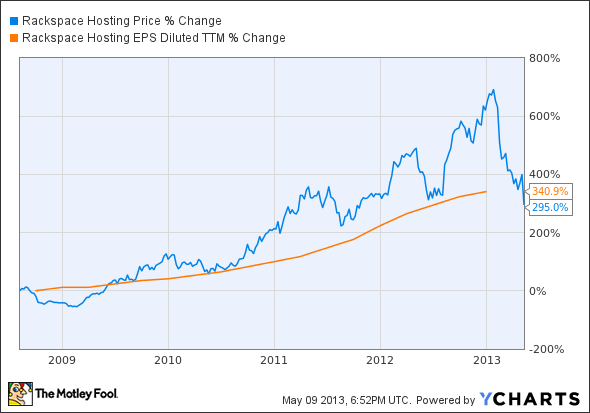 Did Rackspace Deserve This Trouncing? Sales are lagging analyst targets, but the long-term story seems to be intact. Should you buy, sell, or hold Rackspace today? Three of my 15 stock holdings increased by more than 4% on Thursday. Another one jumped 2%. The market was just so full of promise -- some new, some delivering on old vows. And yet, my portfolio barely broke even. Why? One of my newest holdings plunged 25% in one day. Ouch, dude. That swan dive came from cloud computing specialist Rackspace Hosting (NYSE:RAX), based on a disappointing earnings report with a weak next-quarter outlook. The company is waist-deep in moving old customers over to the new OpenStack platform, leaving less resources for seeking out new contracts. So revenue jumped 20% year-over-year to $362 million, but Wall Street had expected $367 million. Rackspace rarely publishes quarterly guidance, but the second-quarter sales range provided this week sits 3% below analyst targets. The report sparked at least four analyst downgrades, but also one opportunistic upgrade. I reached out to Stephens analyst Barry McCarver to see why he's swimming against the stream on this call. McCarver's research note to clients says that the stock is likely hitting "rock bottom" right about now. The upgrade is meant to reap the benefits of an upcoming surge in large enterprise customer signings while the stock is unreasonably cheap. The way McCarver sees it, Rackspace plays in a slightly different sandbox than archrival Amazon.com and most of its traditional competitors. Both Amazon and Google recently slashed the price tags on their "platform as a service" products, playing a time-honored game of price-sensitive sales. But Rackspace didn't follow suit entirely. Instead, Rackspace offered discounts on a couple of key products but actually raised prices on the main platform offering. Not directly, you understand, but by keeping a price premium on the new OpenStack virtual servers when compared to older solutions. Customers are dragging their feet in this transition, which explains why sales came in below expectations. The same trend is also responsible for the weak revenue guidance in the current quarter. But McCarver believes (and I agree) that Rackspace is actually building the foundation of a strong growth engine here. The payoff may be delayed, but it's coming in the second half of 2013, onward. The whole OpenStack strategy is aimed at the enterprise space, where large potential contracts roam free. It's a huge weapon in Rackspace's arsenal, second only to the company's vaunted customer-service focus. You might pay a little more for a Rackspace virtual server, but you also get what you pay for. "Pricing is only one of many metrics in play when large enterprises are picking a cloud platform," McCarver said. And that's why enterprise contracts should provide an upward catalyst in a couple of quarters. "Today, or maybe later this week, ought to be the trough" for Rackspace shares, McCarver said. "The company has tremendous long-term earnings power, and the stock is cheap below $40." Lost in the revenue shuffle, Rackspace actually delivered earnings just above Street targets. I do agree that the long-term story looks intact here, and would treat this trough as a buy-in opportunity. My personal stake and bullish CAPScall are staying put.